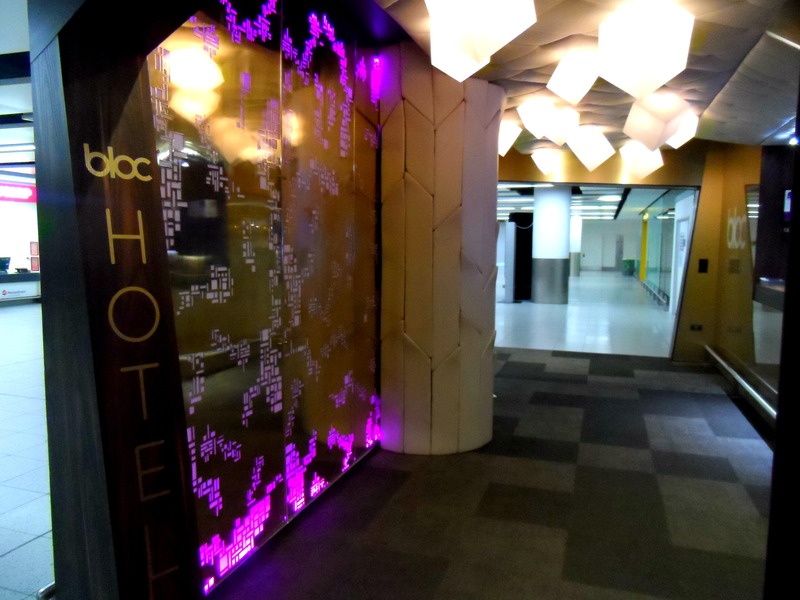 Bloc Hotel Gatwick seemed like a fantastic hotel to stay at as it’s not only close to the airport, it’s actually inside Gatwick’s South Terminal, making it ridiculously easy to roll straight out of bed to the check in desk. 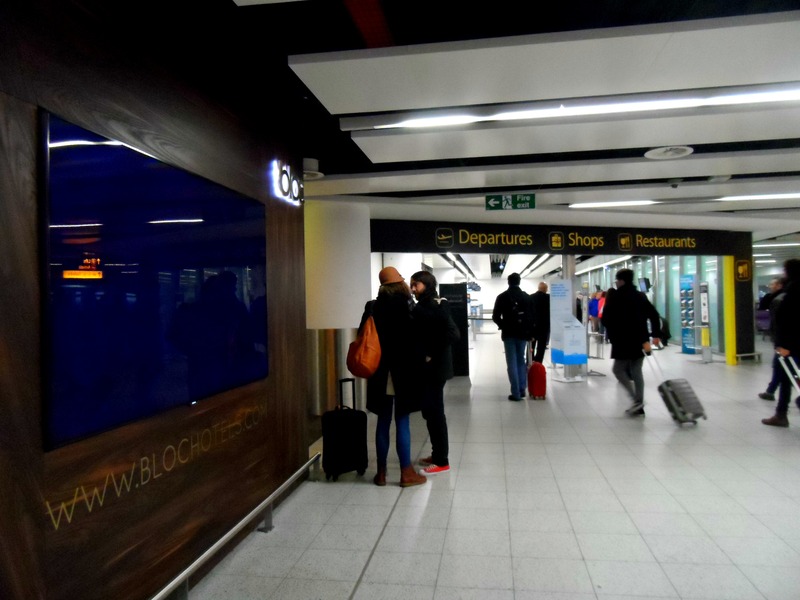 Apart from waiting around getting completely hyperactive about our holiday, there isn’t really much else to do in airports, so Bloc’s new package that includes dinner and breakfast suited us perfectly. As we opened the door to our room, both of our mouths fell open in delight. Not only did the king size bed look ridiculously huge and comfy (so comfy that even the ceiling and walls were cushioned), but the view out of the huge window that wrapped around both sides of the room was simply awesome, looking straight out onto a whole line of stationary planes and the runway behind them. 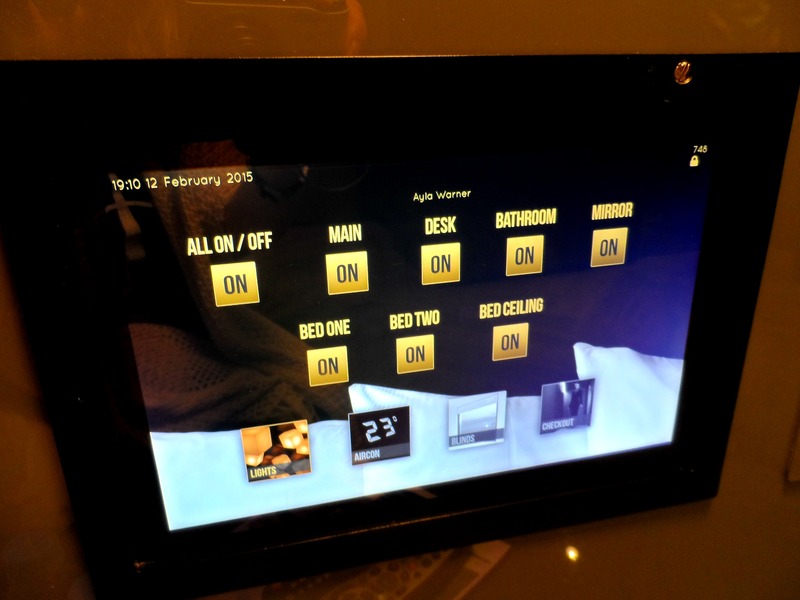 Everything in the room, from the lighting, climate control, black-out blinds (handy for those who need to catch a few hours sleep during the day between flights) and the Smart Sky TV, could all be controlled by a Samsung Galaxy tablet on the wall, and the fact that it had my name on just made me even more delighted. The luxurious bathroom was beautiful with an ornately decorated mirror and a monsoon drench shower. 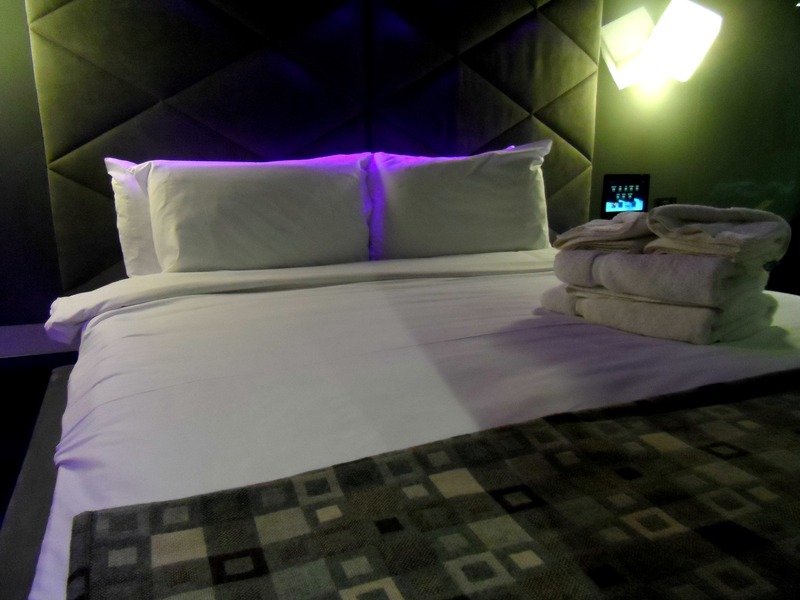 With added little extras such as a hairdryer, Nespresso machine and free WiFi, the room was so much more than just a simple bed to rest our heads in. With my face pressed up against the window watching planes taking off and landing like the excitable little girl I really am, I had to be prised away from this fantastic view for dinner. 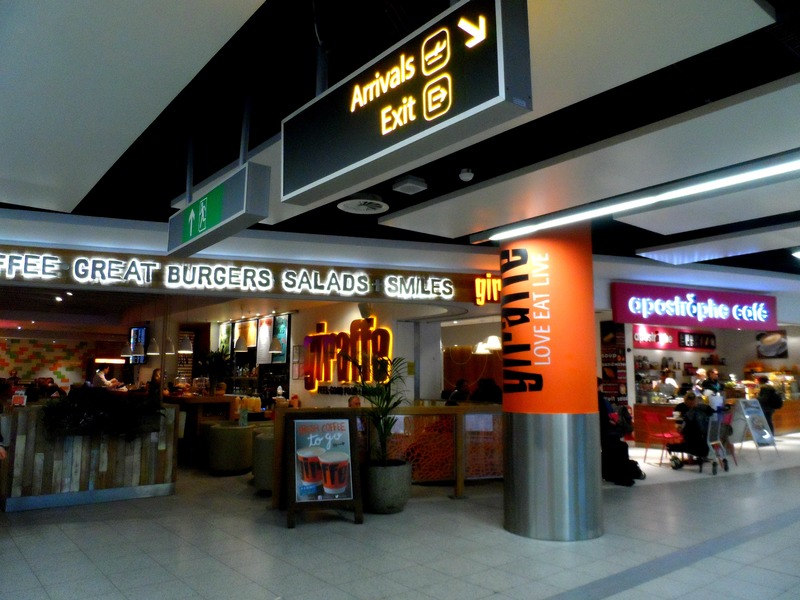 Our package included meals at either Giraffe or Apostrophe, both only steps from the hotel reception. We picked from a Bloc set menu in Giraffe which, although quite a small menu, there was enough on there to keep us both happy. Despite being so close to the runway we couldn’t hear a thing in the peaceful room all night. So the next morning we woke up way before we needed to after a good night’s sleep and sat on the little chaise lounge in front of the window, perfectly positioned to watch the morning’s planes taking off and landing. Once again I had to be prised away from the view for breakfast and, not forgetting what we were actually there for, to check in for our flight. 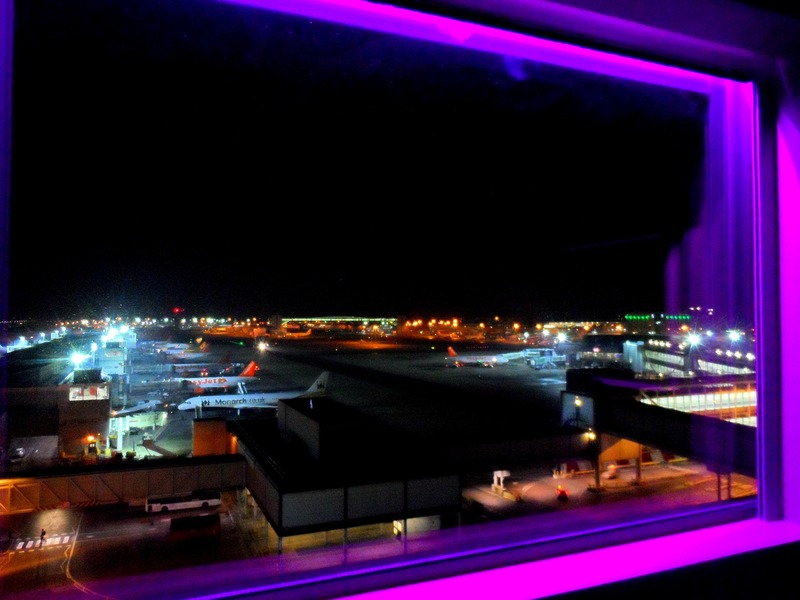 This was the best part about staying at an airport hotel, especially one that is literally right inside the airport. We came out of the hotel, took no more than 20 steps before we reached the check in desk, relieved ourselves of our big suitcases, and off we went for breakfast. 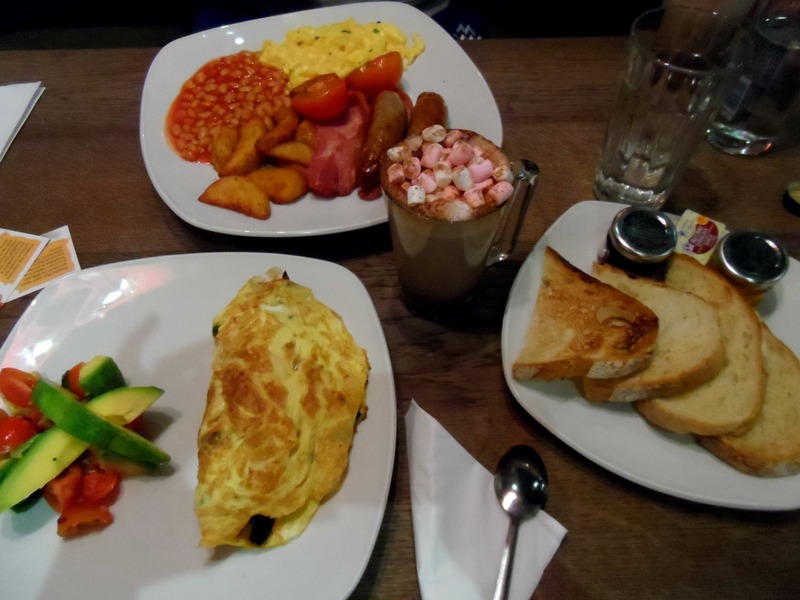 We opted for Giraffe again for their hot filling breakfasts – plus Giraffe make THE best hot chocolate topped with sugary sweet marshmallows. The security gate is right outside the hotel’s reception so after breakfast, instead of wasting unnecessary time waiting around in departures, possibly buying unnecessary things from duty free, we headed back to the room where we thoroughly considered jumping back into bed for a quick nap but decided to just swoon at the view some more. We may have been super excited to be jetting off on a plane to Cuba but we still left our room slightly begrudgingly at the thought of swapping our comfy cosy bed for an uncomfortable plane seat. If I haven’t already made it obvious enough, staying at Bloc Gatwick made the start of our trip soooo much less stressful. For once we were able to take our time getting to the airport – no rushing, no panicking, no shouting at each other because we’d forgotten something or took a wrong turn on the motorway. We had a whole evening and morning before our flight so being late (as is often the case with us) wasn’t an issue. It also meant we got a lot more sleep before an early morning flight and started our trip feeling lovely and refreshed. Plus – extra bonus – staying at an airport hotel the night before a flight means you can technically start your holiday a day early. Winning! What a great idea! I’ve never thought about staying in a hotel the night before but this place sounds fantastic and SO convenient! I’ll have to keep it in mind if flying early from Gatwick I’m future! This place was uber cool! They do day time rates for those people who need a quick kip between flights so you could always just pretend to yourself that this is your case 😉 Where are you off to? Wow…awesome idea! I like to take the early morning flights too. Next time for sure 🙂 the hotel looks awesome. I highly recommend it for early morning flights. I know I’ll definitely be staying here again! I’ve always been the same and booked super early flights and then moaned about getting up so early. This places looks super cool, totally going to have to check it out! What a great idea to do that!! The hotel looks amazing, wow!! 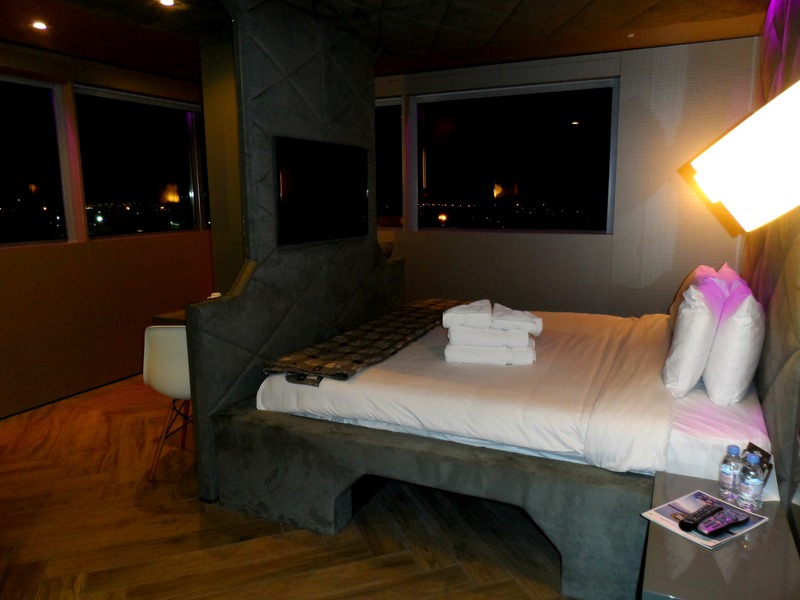 The bed is sooo inviting, and what a view to the airport!! Getting up early is the best! I would definitely recommend an airport hotel for early morning flights though. Makes it so much less stressful. Can’t believe I’ve never thought of doing it before! This idea is definitely awesome! Thanks for share your ideas for starting a wonderful day at Gatwick. Few days after my cousin will come to my place for holidays and I want to give her the best experience near Gatwick airport like you. Already she booked a hotel through arunparking.co.uk site. Hope by your ideas she will enjoy the airport.